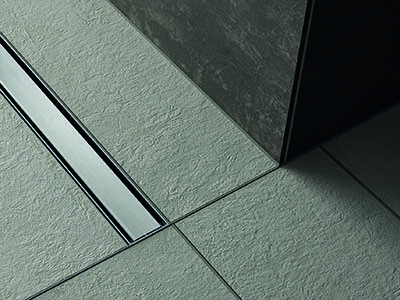 OneWay Fall Showerlay is a walk-in tray with linear drain. The shower tray is characterized by a one-way single slope contoured towards drain channel. We offer a wide variety with multiple brands and prices for different budgets. OneWay Showerlay provides excellent adhesion to shower board and 100% hydroisolation. The OneWay shower tray is a response to the needs of our clients. OneWay Showerlay comes with integrated and waterproofed stainless steel 600mm linear channel, suitable McAlpine siphon trap, and Mistral grating which has a row of various sized circles regularly covering the surface. Drainage is 600 mm long while grating width is 64 mm. It protrudes above the shower tray for 15 mm and below for approximately 5 mm. This product is suitable for most architectural applications. Save space with wetroom, with the average UK bathroom not much bigger than a king-sized bed, a wet room can be an ideal space-saving solution. For installation, we recommend using the manufacturer's tanking kit. Square metre walk in shower tray comes with one of most popular 700mm linear channel. It is fixed to shower former and sealed against water. Other necessary parts are also included, such as suitable grating and waste siphon with water seal height of 20 mm and flow rate 26 l/min. Grate Mistral has a row of various sized circles regularly covering the surface. It is made by McAlpine and can be easily connected to standard pipework. A level wet room kit walk in shower tray 1000 x 1000 mm is a typical size former. Low level and built to offer an excellent amount of shower space, this square shower tray is also incredibly versatile and will work with a variety of shower screens and doors. It ensures the hardness of the surface layer that allows the gluing of even very small mosaics. We include the longest linear shower channel to this walk in shower flooring - 1200 mm long stainless steel channel. It can be used to create very spacious and luxury wet rooms with very large tile size. It is integrated with the tray during the production process and comes with watertight seal. 64 mm wide stylish grate cover and comlpete siphon trap with capacity of 26 l/min and 20 mm high water seal arrive with the former. Grate Mistral has a row of various sized circles regularly covering the surface. is a walk-in tray with linear drain. The shower tray is characterised by a one-way single slope contoured towards drain channel. In case of type of floor and the size of slope we want there are two thickness available:30mm and 40mm. OneWay Showerlay provides excellent adhesion to shower board and 100% hydroisolation. The OneWay shower tray is a response to the needs of our clients. Former comes with integrated and waterproofed stainless steel linear channel, which offers good corrosion resistance to both chemical and atmospheric exposures, with a high resistance to oxidation. In the set there are also suitable McAlpine siphon and grate. Drainage is 500 mm long and 80 mm wide while grating width is 64 mm. It protrudes above the shower tray for 15 mm and below for approximately 5 mm. Grate Mistral has a row of various sized circles regularly covering the surface. Steel is finished with brush, which is practical and particularly suitable for most architectural applications. By choosing the OneWay Showerlay you will avoid diagonally cuts in your tray. 800x1200 mm pre machined tray is the smallest rectangular walk in shower flooring we can supply. It requires a little space making it suitable for most showers even in small bathrooms. A wet room has the potential to be a true work of art, where functionality meets elegance. By choosing OneWay Showerlay you will get also integrated and waterproofed stainless steel linear channel, suitable McAlpine siphon trap with 26 l/min capacity and grate. Drainage is 500 mm long and 80 mm wide while grating width is 64 mm. It protrudes above the shower tray for 15 mm and below for approximately 5 mm. Grate Mistral has a row of various sized circles regularly covering the surface. Steel is finished with brush, which is practical and particularly suitable for most architectural applications. Walk in 800 x 1500 shower tray is rectangle mid-sized trendy corner wet room kit. Modern and becoming more popular in Britain it encases all functions of showers in one accessible space. Create a trendy, stunnig and luxury bathroom while retaining full shower functionality and increase value of your home. OneWay Fall Showerlay is best solution to avoid diagonally cuts in your tray. High quality, suitable shower drainage is included to former, it comes with 600 mm long steel linear and drain. It also comes with grating which is 64 mm wide, leaving 8 mm wide channel for water to flow. Grate Mistral has a row of various sized circles regularly covering the surface. Height from the shower tray surface to the top edge of vertical upstand is 15 mm, it also goes below the tray for approximately 5 mm. McAlpine siphon trap with capacity of 26 l/min. Waste can be rotated and it's height adjusted giving much flexibility during installation. Showerlay is complete unit with everything you need. Shower kit 900 x 1200 mm is designed to give you wet room tray for timber floor level access, it is easy to cut down to size, whilst being lightweight and highly manoeuvrable. Contemporary, minimalist style of wet room will allow your body rest and mind to rejuvenate. OneWay Showerlay is response for our clients questions about one slope tray. Wet room shower tray 900x1500 mm for tiled floor is a popular size for spacious bathroom. Large format tiles can be used to create more seamless, elegant look. Refurbish your old bathroom into inspirational and practical shower room no matter if you have timer or concrete floor. By avoiding diagonally cuts tiling showerlay will be a lot easier. Former has 2% fall towards the drain, provides great acoustic insulation and is also lightweight while very strong. Wet room shower former 900x1600 mm is one of the biggest tray bases in our store. If you can see unused space in your bath and want to add that other bathroom you've always wanted, spacious walk in shower tray will also give you that warm and luxurious feeling of ending and starting your day in a beautiful place. OneWay Showerlay are quick and easy to install and can be fitted easily by a Builder, trays are also easy to move as they are light. By choosing the OneWay Showerlay you will avoid diagonally cuts in your tray. In the set there are suitable shower drainage, it comes with 600 mm long steel linear end drain with grate (Mistral). It also comes with grating which is 64 mm wide, leaving 8 mm wide channel for water to flow. Grate Mistral has a row of various sized circles regularly covering the surface. This is perfect linear channel for tiled floors, as the lip height is 15 mm. It also goes below the tray for approximately 5 mm. McAlpine siphon trap with capacity of 26 l/min and 20 mm high water seal is also included. Shower tray 900 x 1700 mm is the second largest wet room kit in our offer. With great amount of sloped space provided, you can DIY and refurbish your old fashioned bathroom into a modern and contemporary spacious restroom. By avoiding additional cuts in tiles shower tray will look even more excellent. Showerlay allows for quick and easy wet room flooring installation and use. OneWay Fall shower tray gives the installer easier task and complete flexability of building own wet room. The biggest in our store, wet room kit 900 x 1850 mm is shower tray that can be installed in rooms with very large amounts of space. A walk-in shower flooring opens up the bathroom and adds modern simple and fresh look creating a more attractive restroom. It offers people with mobility issues easy accessibility. Showerlay of that size is particulary suitable for large tiles format, although it can still be laid with even small mosaic. By using OneWay Showerlay our clients are avoiding additional cuts in tiles. The set consists of a OneWay ShowerLay with integrated and waterproofing linear drain. Dimensions of drain channel: 500mm long and 80mm wide. This set comes also with siphon trap with flow rate 26 l/mm and waste pipe diameter: 1,5". Sirocco cover holes pattern consists 3 rows of squares, parallel to drain edge. Steel is finished with brush, which is practical and particularly suitable for most architectural applications. 800x800 tray is one of the smallest size of shower tray that we provide. It requires little space, making it suitable for most showers even in small bathrooms. OneWay Fall Showerlay Wiper 800x800 Line Ponente is a must-have for modern bathroom design. OneWay Showerlay comes with integrated and waterproofed stainless steel 600mm linear channel, suitable McAlpine siphon trap, and Sirocco grating, which cover holes pattern consists 3 rows of squares, parallel to drain edge. Drainage is 600 mm long while grating width is 64 mm. It protrudes above the shower tray for 15 mm and below for approximately 5 mm. This product is suitable for most architectural applications. Chat started. Session ID: 1556194015. You are now connected to: David M.